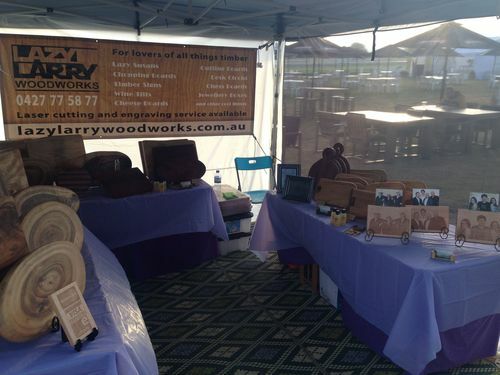 Craft Markets.. #7: Yesterday at Eagle Farm Markets, Brisbane. Have not been to this market for a few months so decided to do a flying visit with some of the new boards. And larger size photo engravings. Nice looking booth. Hope you sell out. I think you did well with it. 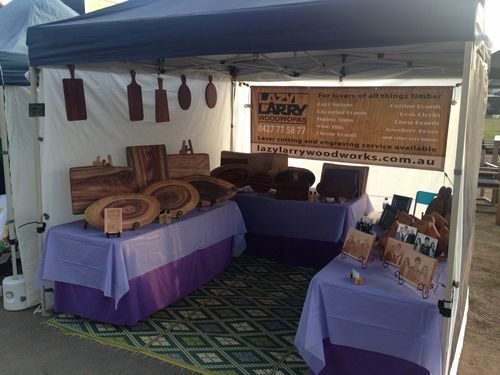 looks great larry,hope you do well!! Larry; My sister just moved to Brisbane a week ago. next time you plan on going let me know and I try and get her to visit you. Real nice booth, Larry. It is good to advertize that neat laser and CNC router for service work too!! That will definitely differentiate your booth from the others. Looks great. I hope you sold a lot. I see the surfboards you spoke about !! I also hope you didnt have to pack up much. Nice looking booth. Hope you have large sales. great looking booth- good luck! What are the slabs on the table to the left? Cutting boards? they look outstanding!